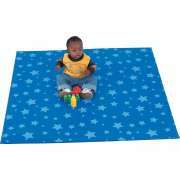 Gym mats enhance the fun and safety of preschools and daycare centers. 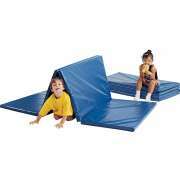 What kinds of tumble mats are good for kids? With a wide range of colors and styles that are made for kids, you are sure to find some great options from Hertz Furniture. 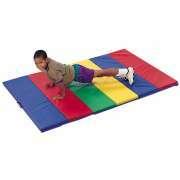 Tumbling mats enable young learners to run, play and develop their skills without fear of injury. All of our gym mats are made of high-quality vinyl and meet the highest safety and fire standards. Whatever your budget or your classroom setup, Hertz Furniture has gym mats for kids that will help you bring out the best in the little ones entrusted to your care. Where do you need tumbling mats? Gym mats serve a number of purposes. When little ones are developing their motor skills, creating exciting obstacle courses will promote development and encourage them to try new things. With an exercise mat beneath the soft play toys that you arrange, both children and caregivers can breathe easy as toddlers take charge and learn new things. Even older children can benefit from some soft cushioning as they practice various tumbling exercises in gym class. When toddlers are running around and having a ball, you don&apos;t want them to be limited more than necessary. 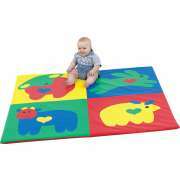 Little ones who are still perfecting their balancing skills can benefit from having some tumbling mats beneath them, especially when they are doing activities which require a lot of quick movement. If a child stumbles or falls, they will be supported by soft cushioning which will prevent them from becoming injured or alarmed. Making children feel safe and protected as they play will get them excited and enjoying the benefits of physical education early on. What will make my classroom floor comfortable to sit on? When little ones in an early childhood education classroom sit on the floor to build with blocks or play with animals, you want to make sure that they have a clean and cozy play area. 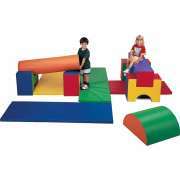 tumbling mats for kids are great for floor play. 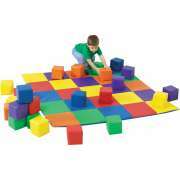 They are cleaner and more comfortable than a hard floor and can be used to designate a special floor play area. When little ones know which parts of the classroom are designated for certain activities, they are less likely to interfere with each other&apos;s games or trip over their classmates who are seated on the floor. 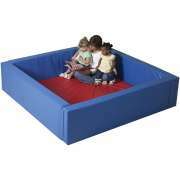 How can you store tumbling mats when they are not in use? Our folding exercise mats are designed for easy use and arrangement. Many of them can be folded up in a flash and some even include handles for easy carrying. Foldable mats can also be tons of fun. 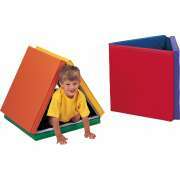 Children&apos;s Factory has specially-designed mats that can be folded into a tent or secret hiding place. This arrangement encourages young learners to take initiative, build and explore. In the process of choosing anything for your daycare or preschool classroom, it is important to make sure that products are built to last. 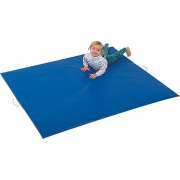 Our tumbling mats will give young learners many years of comfort, safety and enjoyment. They are made of tear-resistant vinyl that is easy to clean. Soft foam cushioning in between the layers of vinyl will stay cozy, even with frequent use. Every early-childhood setting should be colorful and enticing so little ones will look forward to playing and enjoy being there. 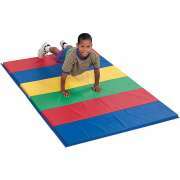 Folding gym mats are available in a wide variety of colors and designs that can be coordinated with classroom colors or gym decor. Choose from a patchwork of brightly-colored squares, rainbow stripes, animal graphics and more. For a more subdued option, we have solid colors as well. How can I prevent paints and project materials from spilling on the floor of my classroom? Tired of cleaning up when messy projects overflow or spill onto the floor? 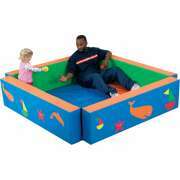 Splash mats are the perfect solution to your needs. If you have a water-play preschool learning center or are doing a special activity that involves messy liquids, a splash mat will prevent stains and make it much easier to clean everything up. It can be used on tables or on the floor to prevent soggy carpets and potentially slippery areas. Children are your most precious asset, so it is important to make sure that they are protected and comfortable throughout the school day. With Hertz Furniture&apos;s great selection of play and tumbling mats, you can feel free to let little ones run and play in a safe classroom environment.